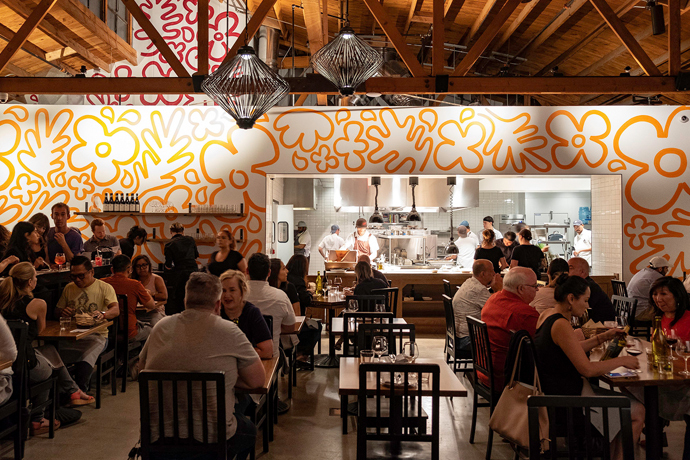 Hum the chorus for Cavatina, the new restaurant at Sunset Marquis that’s finally ready for its close-up after a long, leisurely renovation—it’s now open in West Hollywood. Here’s what’s changed and what hasn’t. Then: Beyond that famous courtyard patio, a dark dining room with red abstract paintings everywhere, disco ball chandeliers over brown booths and surprisingly formal white tablecloths. Now: A brighter, more casual room of two-tops and oversize photos of Hollywood stars. Robert Mitchum smoking. Daryl Hannah petting a pig. James Franco being James Franco. The guy is now officially everywhere. Then: Filet mignon, french onion soup and escargot sushi. Now: James Beard–winning chef Michael Schlow’s here, and he’s got a cheddar-and-crispy-onion burger with horseradish-black-pepper sauce that’s won awards. Plus lardo-uni bruschetta, short-rib-stuffed peppers and pasta made from kale—the only thing more ubiquitous than Franco. Then: The sprawling vine-covered patio next to the stream was one of the most stunning places to dine around. With the city’s best Steven Tyler views. Now: Some things never change.